In the past year, Brooklyn Borough President Marty Markowitz has made several outspoken appearances against proven, life-saving traffic-calming projects. Last month, Markowitz called for the removal of pedestrian refuges on a stretch of Fort Hamilton Parkway where three people have died in the past three years. On the local news and in front of the City Council, he’s called for the removal of pedestrian safety measures and speciously claimed that the popular Prospect Park West bike lane was imposed against public will. He’s cast aspersions on data proving the effectiveness of the PPW re-design, ridiculed bike lanes, and maintained that establishing safer streets for walking and biking “stigmatizes” motorists. At the same time, the borough president has been silent about traffic crashes that have killed and maimed people on Brooklyn streets. After one week this January in which an 83-year-old rabbi was killed and several children hospitalized with serious injuries caused by traffic, Markowitz stood in front of the local TV cameras and called for pedestrian islands to be ripped out of Fort Hamilton Parkway, where three people had been killed in just the past three years. Tomorrow evening, Markowitz will deliver his state of the borough address, and people whose lives have been altered by traffic violence in Brooklyn are asking him to get serious about preventing deaths and injuries — and to stop standing in the way of life-saving improvements to the borough’s streets. Friends and relatives of traffic violence victims have sent letters to Markowitz urging him to take street safety seriously and “change his way of thinking.” Transportation Alternatives sent the following excerpts from those letters. From Naomi Doerner, a Brooklyn resident whose boyfriend Scott Andresen is recovering from a spinal cord injury after a car door opened in the path of his bicycle, throwing him into oncoming traffic. From Wendy Clouse, whose daughter Jasmine Herron was killed while riding her bicycle after a driver opened her car door in Herron’s path. Update: Markowitz’s press secretary said he was aware of at least one of the letters, which the borough president intends to respond to directly. Currently Markowitz is not planning to address street safety issues in the state of the borough tomorrow. So sad it had to come to this, what a sad, out of touch marionette. Just WHAT is Markowitz’s problem? Is he the poster child for AAA, or what? He appears to have a serious deficiency either of heart or of mind, possibly both. Being a mouthpiece as he is for the motoring lobby is both unconscionable and retrograde, especially in America’s #1 urban environment, New York City. Hey, Marty, you SHOULD enthusiastically support and promote safe cycling and walking in Brooklyn and throughout NYC. Our City collectively GAGS on motor vehicle traffic–its fumes, its noise, its sheer physical ubiquitousness, on a daily basis. Worse, many New Yorkers are killed or injured by it every year–so how in God’s name can you or ANY of our public officials, acting supposedly in good conscience and in the public’s interest, actually promote private moptoring as a transportation choice? Marty, your pro-tailpipe attitude might be understandable in Sarah Palin’s Alaska, but NOT in MY hometown, New York City. WHEN will you start engaging your heart AND your mind and start acting in your public’s best interests? Part of the problem is that driving, in a transit-rich environment where there really are alternatives, is viewed as a social promotion. Anything that challenges that promotion (whether real or imaginary) becomes a red flag to a bull. Markowitz is clearly calculating that bulls vote and the rest of us can be safely trampled. Excuse me if this seems ageist, but is this the inter-generational perception of a man who’s old and out of touch? I hope so, because I’d hate to think that the slaughter is just going to go on and on until the fuel shortages begin. In the meantime, whatever his motivation, this man is no longer just a clown, but a public enemy. Well said Mark, I think there is ageism and classism at play here, and you’re right, he is playing them. The offensive part is the downside: our neighbors (and us) are being killed, hurt and frightened, while using these streets. I wish victims would try to educate him. I just forwarded this link to Gothamist. Anyone know anyone else at a local news source? necessary. And it is very, very powerful. When does Marty’s term end? Time for a countdown clock! I am so moved by Ben’s post and the political advocacy and human expression it’s based on, that I’m nearly at a loss for words. The eloquent, piercing statements gathered by T.A. come from six individuals who collectively have lost, or are having to bear grievous injuries to, two daughters, one spouse, two significant-others and one friend — all in Brooklyn. Their testimonies are heart-rending; yet by collecting and harnessing them, T.A. (and Streetsblog) has made them a powerful vehicle for change. For me, Ben’s piece is a signpost of how far the movement for livable streets has progressed. Thirteen years ago, in Nov. 1997, I participated in a day of “Killed By Automobile” stenciling in and around Borough Park. We spray-painted 15 “street memorials” to pedestrians killed by drivers. Our action was both righteous and political; and it and similar actions at that time, along with related essays like this, may well have contributed to a dawning of public consciousness against driver violence. Yet the uprising now underway against killings by auto and against officials, like Marty Markowitz, who enable them, is so much more thoughtful, sustained and effective. At least that’s what I take from Ben’s post. It gives me hope. Sadly, I don’t think Marty will be ever convinced. He just has to be defeated. Luckily, he can’t amend term-limits for his own benefit, so he doesn’t even have to be defeated. But people like him will have to be defeated. What a powerful collection of personal stories from people who have suffered terrible losses. I applaud their courage. It’s not only about convincing Marty, although that would be nice. It’s also about convincing the media and other politicians that losing a traffic lane or parking space is doesn’t come close to the loss of these precious lives. When Marty gets on TV to decry pedestrian refuges or bike lanes and the imaginary threats they pose to human life, but can’t seem to find a microphone when real people are injured or killed in real incidents, he’s making his own powerful statement, too. I agree with Charles. This is one of the most moving posts I’ve read on Streetsblog. Thank you, Ben, and thanks to everyone for sharing their stories. Back in December, I corresponded with Markowitz’s office about Emilie Goissaux (this was shortly after him singing a song about there being too many bike lanes). In a 1960s car rental commercial auto riders are depicted in a seated position floating along the street in an invisible car. The seductive metal and glass carapace stripped away leaving the ridiculous image of the mobile couch potato grinning at his conquest over the natural forces of gravity and wind resistance. Contrast this image with the common and mostly uncelebrated sight of a bicyclist, actively engaged, fully responsible for her own propulsion, just like the striding pedestrian. I walk this city every day knowing that, despite all my caution, the most likely cause for my own premature death lies in the imperfect mind of the grinning couch potato commanding his/her metal box on wheels. It won’t change until the act of turning an ignition key is as shame inducing as the act of public uriniation. Something not done by right thinking people. Marty is at least an enabler to allow the egregious death of seniors and children in his borough to now go unchallenged for his near 10 years at the pulpit. To ignore this type of preventable death and rail like the blowhard he is about a little concrete piece of safety is now reaching a critical level and people are finally turning on him. He likes to label folks that believe in these issues: “anti-car”, “zealots”, and “jerks” and wrongly accuse people of lies and ridiculous coordination (see: PPW bike lane) who just trying to make the world a safer place. And the ironic thing is: many of these people are car owners or use Zipcars regularly. It’s lunacy. The best thing is that the snowball that has been picking up steam this Winter will continue to roll on thru the final years in his term and the bad press and growing community outrage in every corner of Brooklyn will completely damage his “legacy”. Egypt’s Mubarak stayed on way, way, way past his time. Marty has too. The only thing Marty Markowitz gets serious about is eating. Real journalism reports the full story, not just selective facts that fit a particular narrative. You know full well that Marty Markowitz takes road safety seriously, and that he has created road-safety materials for public dissemination that call attention to the need for all road users to obey traffic laws and respect life when traveling. The material can be found on his website: http://www.brooklyn-usa.org. There is a difference between objecting to the reengineering of road space and rejecting road-safety. Try to tell the full story for your readers. So, a token sermon on his web site is supposed to make up for his active work against traffic safety measures that actually work? You’re joking right? So Marty sitting on a bike for a photo-op means doing something constructive? After all, who are you going to believe, Marty or your own lying eyes? Marty’s office has created a pamphlet about sharing the road. It’s pretty good. How many people will see this pamphlet compared to all the people who’ve seen Marty on TV castigating the city for making engineering improvements that save lives? Not many. What will be the positive effect of Marty’s pamphlet compared to the negative effect of his attempts to attack, stall, and undo the engineering changes underway in Brooklyn? Negligible. Marty is actively working to thwart progress on street safety. In this campaign, Marty has lied, slandered people working to making streets safer, and sought out maximum media exposure to air his point of view. His point of view is that streets should be designed in ways that we know endanger people. Don’t forget Marty’s anti-bike lane holiday card, mailed to thousands of people for who knows how much money. It was probably seen by more people than will ever click on that link or read his road safety pamphlet. Apparently, tonight you can watch Marty’s speech at BRIC. It says that Marty will be “remembering Brooklynites who passed in 2010”. I wonder if that will include any victims of the road? Tune in. Scott and I applaud and thank you and TA for putting together such a well thought out piece. Reading it, we were reminded of how lucky we are, for few pedestrians and cyclists involved in these catastrophic accidents gets a second chance like Scott. It is the strength of others, people like you, that has given us the courage and strength to push through the last seven months. We’ll do our part to give back, as others to theirs to advance safer streets for everyone. Luke, since you have taken up the position of towing the BBP line by providing a link to his site, referencing a publication — paper — as the BBP’s solution to very painful, life altering, and in some cases, life-ending, yet totally preventable crashes on our streets, I hope you will ask yourself and Mr. Markowitz this: What substantive, life-saving ideas do you have or are you contributing to making our Borough and City’s streets safer for all its users. Scott and everyone else — pedestrians, cyclists, and motorists alike, we all deserve more of an answer than a pamphlet on how to share the street. We deserve safe and civil street designs so that we may arrive at our jobs, homes, and to our loved ones, unharmed, regardless of our mode choices. And lastly, we deserve representatives that will offer up substantive solutions on how to keep the public they serve safe. With that, thanks for this forum StreetsBloggers. Is this Luke DePalma from Brooklyn Borough Hall? The idea of you castigating Streetsblog — or anyone, for that matter — about factual accuracy is utterly, totally ridiculous. Ever since Marty turned the Prospect Park West redesign into his signature issue, he has been spewing slander and misinformation at a truly alarming rate. To suggest that Marty is anything other than an opponent of safe streets is absurd. Marty has been very clear about his opposition to NYC DOT projects that make streets safer for pedestrians and cyclists. He has been equally clear in his callous responses to the families of victims of motor vehicle crashes. Instead of making petulant comments on Streetsblog, why don’t you set up an interview between Ben Fried and Marty so the BP can clarify his positions, justify the slander and misinformation he’s been spreading and confront some actual facts? Let Ben have the same time you gave to Marcia Kramer in that utterly embarrassing interview a few weeks back. Naomi Doerner states it beautifully. What IS Marty Markowitz doing to reduce and prevent the ongoing motor vehicle carnage on Brooklyn’s streets? What are his ideas? Marty has been in Borough Hall for nine years now. What has he actively done to make Brooklyn’s streets safer? Marty has done virtually nothing. Nothing. He has no ideas. He has no apparent interest in these issues. More than that: He does seem to be working his hardest to get rid of NYC DOT projects that make streets safer. In the first week of January alone we saw three unbelievably horrible and tragic incidents — the mom of 9-month-old twins run over on the sidewalk in Sunset Park, an elderly rabbi run over and killed crossing the street in Midwood, and a 3-year-old boy in a baby stroller hit by a car and severely injured in Williamsburg. 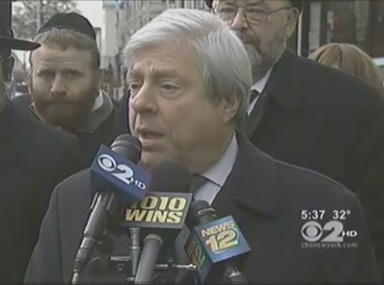 What was Marty Markowitz doing that week? He was working overtime to tear out bike and ped safety projects on Prospect Park West and slander NYC DOT commissioner Janette Sadik-Khan. Bottom line, Luke: Marty has had nine years to produce ideas for making Brooklyn streets safer. He has nothing to show for it but a brochure. I did not castigate Streetsblog for factual inaccuracy. I criticized Streetsblog for issuing a one-sided piece on Marty Markowitz’s position on road safety. It is true that Streetsblog did not cover Marty’s road safety brochure because of comments the B.P. made regarding Fort Hamilton Pkwy’s pedestrian refuge islands… which is another way of saying that Streetsblog didn’t cover Marty’s road-safety material because doing so would not fit this site’s narrative that Marty is the bogeyman of all Livable Streets progress. -Show me your proof of this. I have seen Marty’s personal correspondence with many of these individuals. I have not seen a callous response to them. -Marty’s staff has worked for years, long before DOT or any other local governmental agency got involved, on making the Brooklyn Waterfront Greenway a reality. His office also worked with DOT to find a feasible solution to preserve the Kent Avenue bike lane when its initial incarnation negatively impacted businesses in Williamsburg and locals called for its removal. He also threw support behind the 9th Street bike lane to Prospect Park, a lane that was contentious up until a year or so ago. Now, I realize that Marty’s material on road-safety is just a brochure. However, can we not agree that any contribution made toward educating people on road safety is worthwhile? Marty has an audience that does not necessarily read Streetsblog or subscribe to Transportation Alternative’s mailing list. I think it’s important to try to reach them. Plenty of people in NYC don’t know and don’t care about being mindful about human life when on the road. That lowly brochure is a small contribution to educating people to be more considerate so that fewer people have to get injured or die. It was definitely not created to win any of Streetsblog’s readers over or to indicate a change in tune from the borough president regarding PPW. It was made and distributed because it was the right thing to do. So Luke, the fact that when Marty responds, he doesn’t write, “Screw you” – does that count as not being callous these days? How about doing, as Aaron pointed out, not one substantive thing in his time in office. You point out that some of his constituency doesn’t read Streetsblog or aren’t members of T.A. Well then, wouldn’t you agree it’s a great opportunity for education – instead of spewing (and that is the right word), the lies he said just last night ? Not only is there ZERO evidence to support that, he knows the study the DOT did, in fact shows the opposite. Why not ask the families and loved ones of the people injured or killed? Some of them right on this board. “Reading it, what he said is one thing, but watching the video this morning, seeing him gloat as he peddled into the auditorium on his senior cycle, Scott and I were deeply hurt. Mr. Markowitz truly added insult to injury. Marty Markowitz Derails Prospect Park West Bike Lane — For How Long?